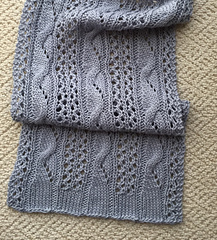 The Beatrice Cowl, Scarf, or Wrap pattern is part of my Piccadilly Collection. Each pattern in the collection carries a central theme – cables and lace. 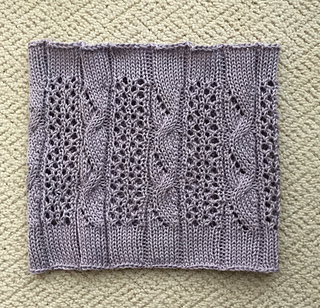 Interchangeably, these cables and lace stitch patterns have evolved into a series of slightly different stitch combinations – each with their own unique style. 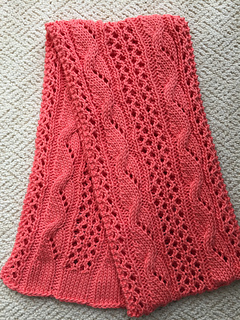 Beatrice incorporates Phoebe’s signature cable pattern and offsets it with columns of eyelet lace. 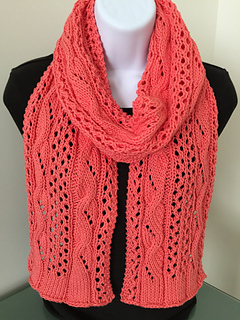 The knitting skill level is intermediate and above. 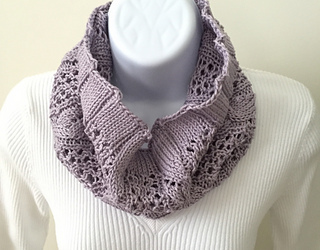 Knowledge of cables, basic lace work (yarn over increases, decreases), and knitting in the round is necessary. The pattern is both written and charted for easy interpretation. Similar to her sister patterns, Bea is quite versatile as a cowl, scarf or wider wrap – the perfect ‘all-in-one’ pattern to knit accessories for you, someone special, or holiday gift giving. If there are any questions, please e-mail me at: dmdesignworks@outlook.com.